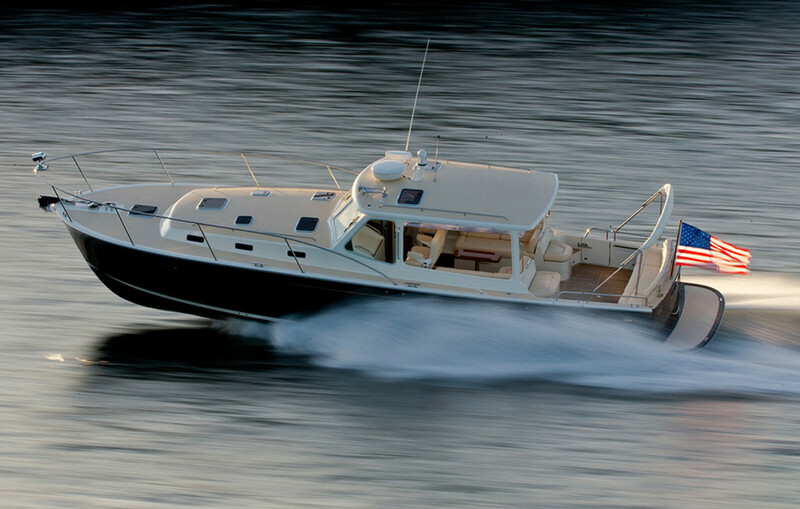 MJM Yachts is offering Yanmar propulsion on the 36z and 40z models. The MJM 40z is one of two 40-foot vessels certified as ISO Category A Ocean, the highest rating possible for seaworthiness. It comes standard with twin 370-hp Yanmar 8LV diesel sterndrives. The 4.46-liter, 8-cylinder engine goes from 550 rpm at idle to 3,800 rpm at the top end. The Yanmar 8LV-370 has a dry weight of 959 pounds without gear and 272 cubic inches of displacement. Cooled by a centrifugal freshwater pump and lubricated by an enclosed forced system, it meets U.S. EPA Tier 3 standards. Buyers of the 36z can opt for twin Yanmar 6BY3, 260-hp diesels. The inline 6-cylinder engine achieves its rated speed at 4,000 rpm. Weighing 723 pounds without gear, it has a displacement of 183 cubic inches. It features a direct-injection combustion system, a 12 V electric starting system and alternator and enclosed lubrication system. The 6BY3 meets U.S. EPA Tier 3 standards.